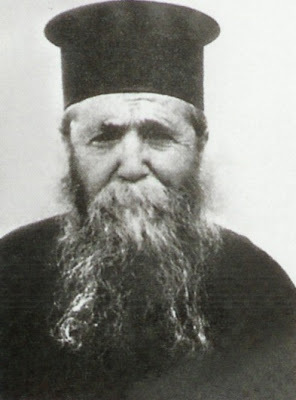 The ever-memorable Elder Arsenios was born in 1886 in Pontus. At a young age he became inflamed with divine zeal and walked from Russia to the Queen of Cities (Constantinople) and from there boarded a ship for the Holy Land. For about a decade he served in the Holy Sepulchre as well as other shrines there. 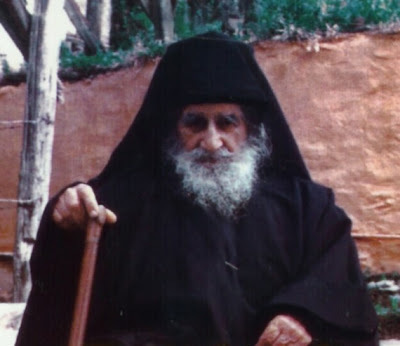 While there, by divine providence, Arsenios became acquainted with the well-known ascetic of Aegina, the blessed Elder Ieronymos, from whom he learned his first lessons in the ascetical life. 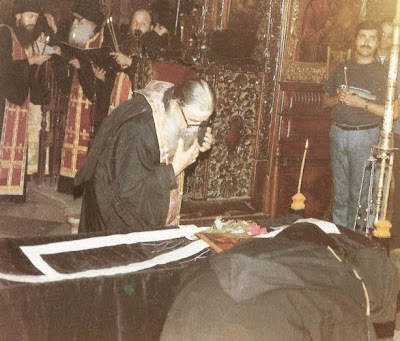 Enflamed with divine love, his soul began to thirst for a life away from the troubles of this world and he fled to Mount Athos, the Garden of the Panagia. His first few years he spent at the Holy Monastery of Stavronikita, where he also received his Great Schema and was named Arsenios. He had been named Anatolios when he received his rason in Jerusalem. 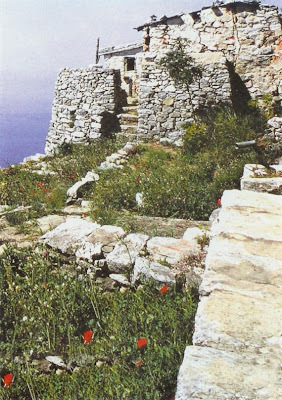 Since Stavronikita at that time operated under an idiorhythmic system, Arsenios desired greater ascetic feats and thus abandoned the monastic life and went into the "wilderness" of Mount Athos in search of great ascetics from whom he could learn and imitate by example to reach perfection. The Lord, knowing his desire, did not take long to grant Arsenios that which he desired. In his search he found another young man with the same desire as himself. 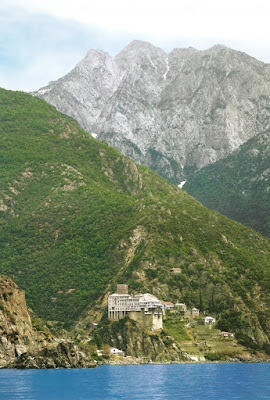 They met for the first time on the very peak of Mount Athos. The power of the Holy Spirit brought these two together as if by a magnetic force. And from that moment the two would not leave each other's side. This other young man was the blessed neptic ascetic famously known as Joseph the Hesychast, one of the greatest Saints of the 20th century. At the time he was just a simple layman named Francisco Kottis. The two young men then became like bees gathering whatever good and beneficial thing they could from throughout the wilderness of the Holy Mountain, in order to bear the most abundant fruits of the Holy Spirit. 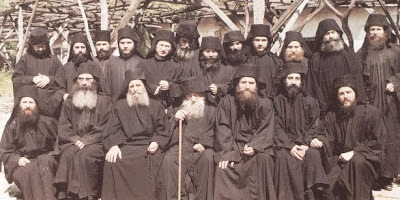 They first met the famous Elder Daniel Katounakioti, then Kallinikon the Hesychast, as well as Gerasimos and Ignatios, and whatever other beautiful flowers had sprouted in the wilderness. 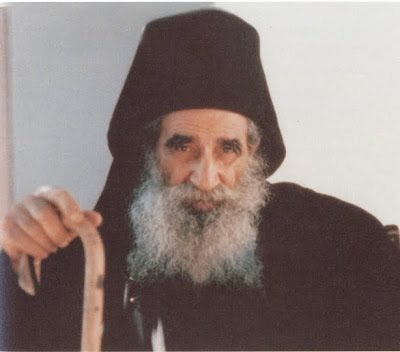 In one epistle, Elder Joseph the Hesychast writes: "All the caves of Athos received me as a visitor, step by step...in order to find a spiritual father to teach me heavenly contemplation and works (θεωρίαν και πράξιν)". High in the caves of Saint Peter they found their hearts desire, the rose of the desert, Papa-Daniel the Hesychast. 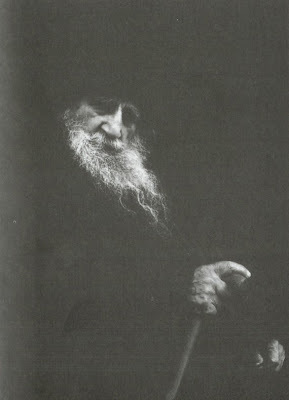 This great ascetic Liturgized every night at midnight between 3-4 hours. This was because it was filled with many interruptions due to the Elder's compunction and emotion during the Liturgy, and it is said that the dirt on the ground would turn to mud from his many tears. He had many spiritual gifts bestowed on him by the grace of God, including that of clairvoyance. All his life he only ate dry foods (ξηροφαγία) once a day at most. It is from this great ascetic that the young Joseph and Arsenios learned the discipline of eating only dry things once a day and the importance of being vigilant. Elder Arsenios once confessed that for many years he would do 3,000 prostrations every night, and the rest of the vigil he would do standing. For many years, the two spiritual brothers had no bed on which to rest from their very difficult labors. After a vigil that would last throughout the night they would only rest their weary flesh on a small bench while seated. As for food, the two spiritual brothers would only eat once a day dry foods, primarily dried bread which often was even spoiled or infested with worms. On weekends, if they were able to find it, they would eat whatever they could except meat, but still only once a day. 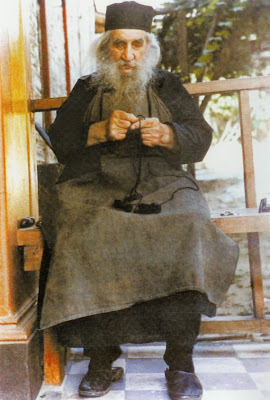 Besides these labors, Elder Arsenios worked with his hands as well. In those initial years he lived high at Saint Basil's, and it would take him everyday 1-2 hours to walk up and down the hill to provide support not only for themselves, but for all the ascetics of the area. Like Sysiphus, he would carry stones and whatever necessities for preservation and the building of stone shelter and walls. Because these feats were beyond human strength, Elder Arsenios was once asked how he did all these things. The Elder responded that he would always say the Prayer of the Heart and this would lighten the burden and a higher power would come to his aid. With the Prayer on his lips, the Elder confessed, the necessities he carried up the hill were a light burden, even in the peak days of summer heat. Reagrding attire, for many years the two ascetics, whether it was winter or summer, dressed in rags and walked around shoeless, to the point where many regarded them as "fools". But they weren't fools in a worldly sense, but for Christ. For them, the words of the Apostle rang true: "They wandered about in sheepskins and goatskins, being destitute, afflicted, tormented - of whom the world was not worthy. They wandered in deserts and mountains, in dens and caves of the earth" (Heb. 11:37, 38). 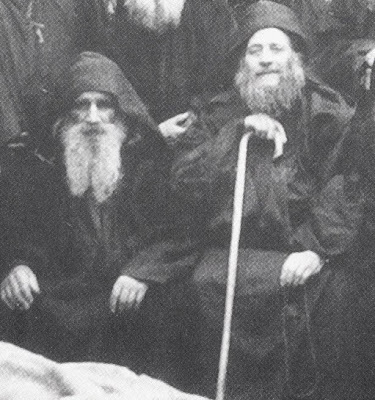 Because these two great ascetics lived approximately for twenty years high in the Skete of Saint Basil, in 1938 they decided to move to a lower area in the Skete of Saint Anna. They did this with a small brotherhood who had gathered around them during this time. There they stayed until 1953. After 1953 they moved to a still lower area to Nea Sketi. 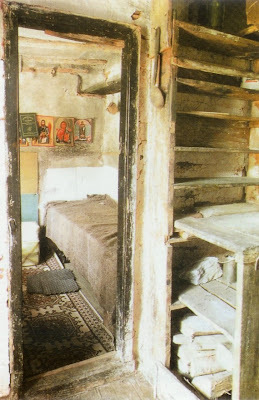 The great ascetic Joseph the Hesychast fell asleep here in 1959. 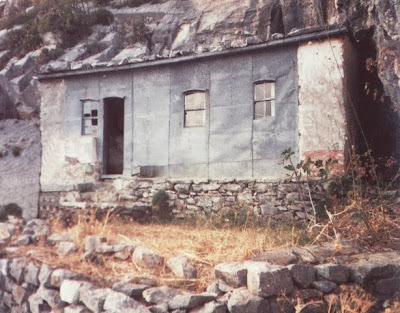 After a number of years Elder Arsenios moved from Nea Sketi and spent twelve years in a cell at Chilandari Monastery known as Burazeri. 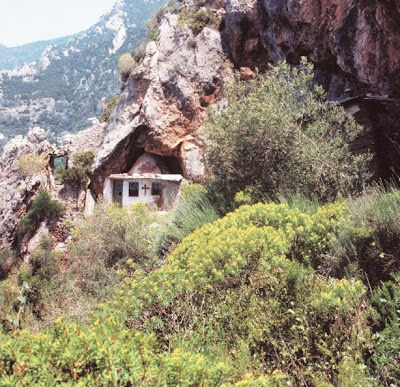 The last three years of his life he lived in the Holy Monastery of Dionysiou. 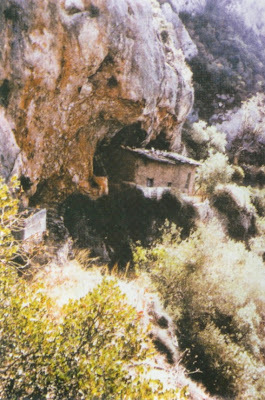 Because this monastery is dedicated to the Holy Forerunner John the Baptist, Elder Arsenios had him as his protector untill the end of his life. 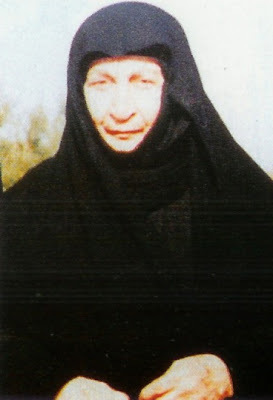 It is here that he fell asleep in the Lord on September 15, 1983 at the age of 97. May his memory be eternal and may we have his blessing!